The history of Vallauris is lost in the mists of time where its fate was linked to its Ligurian neighbour, Antipolis (Antibes) : at 247 metres in altitude, on the present site of the Encourdules, a Roman hill fort was found. 19 AD A milestone dating from the time of the Emperor Tiberius is discovered on the Julian Augustus way. The Romans occupy the hill until the end of their reign. Around 400 The inhabitants “descend” into the present site of the village, which lies in a depression. 1501 First settlements occur : Lord Raynier of Lascaris encourages families from the surrounding area of Gênes to settle and repopulate the village. 1568 On the base of the priory a castle is built in the Renaissance style. 1815 : Napoleon lands at Golfe-Juan on 1 March on his return from Elba ; this event marks the beginning of the One Hundred Day campaign. 1862 The first train arrives in the station at Golfe-Juan. From 1870 to 1910 Pottery-making reaches its height, as the smaller workshops become industries. 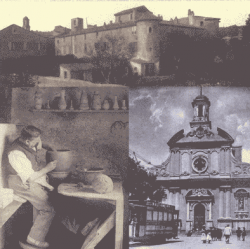 1889 Clément Massier shows his lusterware ceramic work at the universal exhibition in Paris. 1904A cooperative of orange producers known as the Nérolium is formed. 1932 The ‘Route Napoleon’ opens in Golfe-Juan. 1948 Picasso comes to live in Vallauris. 1949 Picasso is made a freeman of the town and donates ‘Man with a Sheep’ to the town. 1949 The marriage of Rita Hayworth and Ali Khan makes headline news in all papers. 1956 Picasso donates War and Peace to the French State : Vallauris is given a national museum. 1975 Jean Marais opens an art gallery. 1978 The town acquires works by Magnelli and opens a public gallery. 1989 Construction of the port Camille Rayon ; new beaches are created. 1996 et 1998 : André Villers and Jean Marais are made freemen of the town. Today Vallauris continues to give birth to new talents thus perpetuating the artistic tradition.